The first record of surfing was during the final voyage of Captain James Cook, 1779. Surfing was a central part of ancient Polynesian culture with the chief as the most skilled wave rider and having boards made from the sacred Koa wood. In 1821, European missionaries forbade surfing and crafting boards being associated with sacrificing and praying to their gods. Even so the artisans remained and boards from 9 to 18 feet were built and ridden. The surges and pulses of an awesome ocean challenge surfers to make magic boards for riding those waves. A stand to work on and show their craftsmanship is prerequisite. 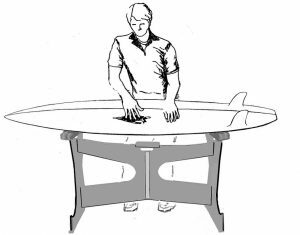 The Surfboard Display, Shaping or Repair Stand was designed out of need for presenting, holding, or working on various sizes and shapes of surfboards. 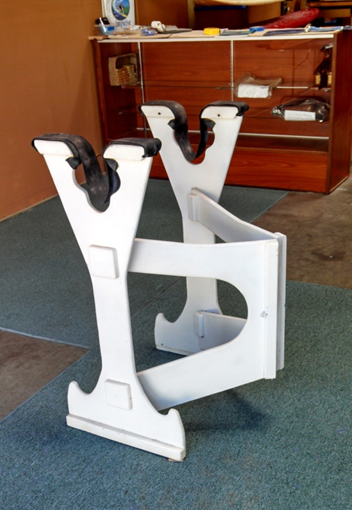 It has numerous features both in use and in storage—hereafter it will be referred to as the stand. 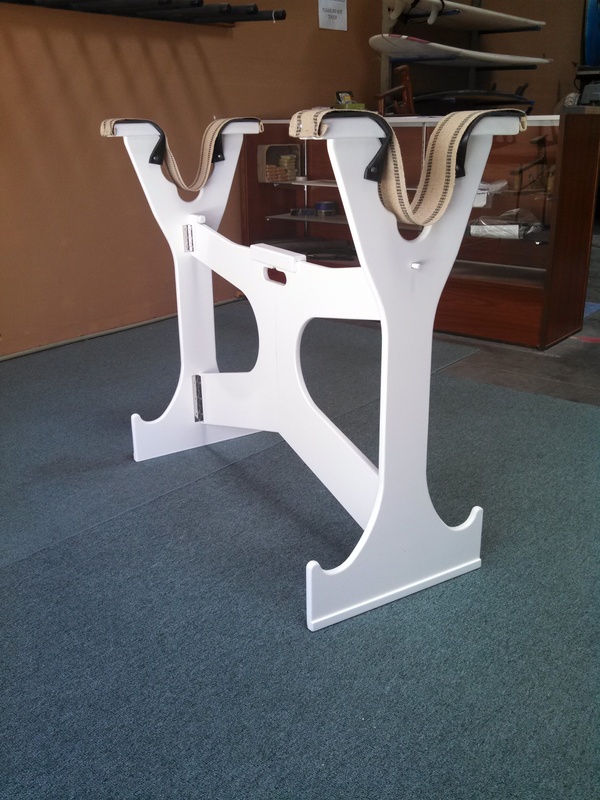 The dimensions and characteristics of the stand evolved out of practical usage and artistic construction techniques. See drawing 2. When an individual desires to put the stand out of way it collapses neatly into a space narrow enough to hide behind a door. 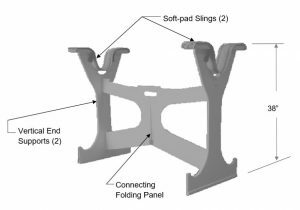 Simplicity in opening and closing the stand is made possible by a collapsible hinge / locking system that holds itself securely in place when in use. The compact design (when in the collapsed position) allows easy transportation behind a seat or in the trunk of any vehicle. It is made from Baltic birch plywood so it is strong and light weight. If the stand is left in the open position, it can be used to store at least 3 boards. .When working on or displaying a board it has numerous angles for holding the board. 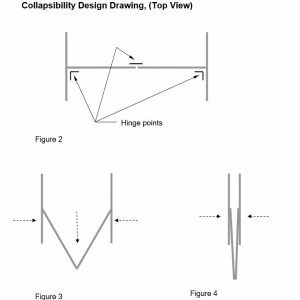 Drawing 3 discloses functionality when open and in use. Soft-pad Slings cradle a surfboard at various angle positions. Boards can also be placed with the surfboard rail resting in the curve hook at the base leaning against the Vertical End Supports.